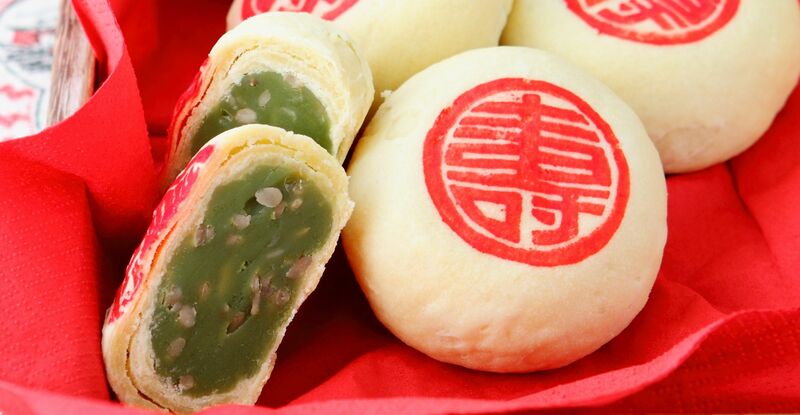 Soft and crumbly, these flaky pandan mooncake biscuits are the perfect snack or gift for pandan lovers. Mix ingredients; divide into 50g portions. Combine margarine and sugar; add flour and water, and mix to a dough. Knead, cover with tea towel, and rest 10 minutes. Combine all ingredients to form a soft dough. Divide into 8 equal portions. Roll water dough out into a long sausage. Cut into 8 and flatten each into a circle. Place oil dough in the centre and wrap water dough around it. Flatten and roll out into a long rectangle, then roll up like a Swiss roll. Flatten again into a rectangle, then roll up again. Flatten into a 12cm circle and place a ball of filling in the centre. Wrap dough around filling, twist to seal, and pinch away excess dough. Shape into a ball, flatten slightly, and place on a greased baking tray. Stamp with red colouring. Pre-heat oven at 180ºC. Bake till light brown, about 20 to 25 minutes. Cool before storing.